Ever wonder what the most popular gear choices on trail were, and whether they were worth it? If you're a gear junkie, this post is for you. If not... well.... sorry. There will be some non-PCT posts one of these days. Maybe. This particular pack was a trail favorite for a lot of thru-hikers. At just over 2.5 pounds, it proved to be a great pack for ultra-lighters who could keep their pack weights below 40 pounds. Another trail ULA favorite was the Circuit - the Catalyst's smaller, lighter brother, if you want to lighten your load even more. Granite Gear has several different packs that thru-hikers oogled over, but the most popular by far was the Crown. With a large 60 liters of capacity and weighing in at 2.2 pounds, it proved to be a great fit for a lot of hikers. Plus, the roll-top ensured that the pack could expand and collapse as needed when you're carrying more or less than usual. The Crown's little brother, the Blaze, was also a popular favorite. The lightest on the list at 1.6 pounds. Personally, I think once you start shaving too much weight from your pack, you lose comfort and durability, but some ultralighters can pull it off. 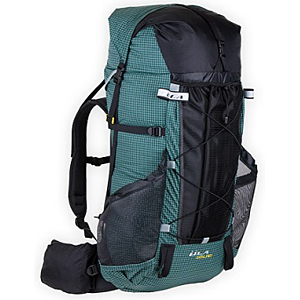 This pack was usually seen on the hikers who were carrying a sub-10 pound base weight. Impressive. I saw a lot of different iterations of this pack on trail. It comes in a men's 45 liter, men's 62 liter, and a women's 52 liter. I saw every size/color of the Flash throughout the trail, since there have been several updates over the years. This is the pack I carried, and I loved it. It weighs just under 3 pounds for the 52 liter size and I found it to be really comfortable. I was jealous of those who could pull off the 45 liter size effectively. I had to wear the 52 to fit all my stuff, and even that was a challenge when I added a bear vault. Hands down, this was the most prolific water filter on the trail. Gone are the days of pump-action water filters. They are slow, heavy, and way behind the times. These days, thru-hikers carry gravity, squeeze, or in-line filters for convenience, weight, and speed. Each type has its own pros and cons. The squeeze is notable for its small size and ease of use. You simply screw the filter onto a water bottle filled with untreated water, then squeeze the water through the filter into another clean water bottle. Alternately, you can simply drink the unfiltered water directly through the attached filter. a) It takes time to filter your water. When you're in the desert, carrying up to 6 liters of water at a time, and you're planning on doing a lot of miles, filtering water is time consuming. You can sometimes spend up to an hour filling dirty water bottles and squeezing them into clean bottles through the filter. For a hiker who always wants to be moving, it can be frustrating to stop at each water source and take so much time filtering. b) The squeeze bags the filter comes with break. Granted, this isn't too much of an issue because most people just use water bottles instead. But the squeeze bags are quicker and less prone to air pockets. Unfortunately, they also spring leaks quite often. c) You have to keep track of your dirty/clean bottles. I can't tell you how many times I saw a hiker accidentally filter water into one of his dirty-water bottles, despite well labeled bottles. Making that mistake can quickly contaminate a lot of hard work. When you have half a dozen water bottles to contend with, it can be easy to mix them up. In the end, most people who had Sawyer Squeeze filters ditched them for something simpler, like Aqua Mira drops. After a while they just weren't willing to take the time to sit at a water source and filter water for an hour. The Platypus Gravity Works has a few pluses that the Sawyer Squeeze doesn't: you don't have to sit and manually squeeze water through a filter for an hour. And you won't mix up your water bottles. It does the work for you, by simply filling up the labeled "dirty water bag" and letting gravity filter the water through the filter and into the clean water bag. The con, unfortunately, is the time it takes. In the beginning all gravity filters are pretty speedy, but as you use them, they slow down, and even with a good cleaning and backflush, they're never quite as good as brand new. With two attached water bags (often ranging between 2 and 4 liters) they can also be bulky in your pack, depending on how much water you're carrying. In the end, this is a good system but your breaks at water sources will still be dictated by how fast your filter is filtering. I find this filter to be the best of both worlds, and it was the one I carried throughout the trail with nothing but love for it the whole time. This system essentially takes the water bladder and filter from the Platypus gravity system, but it eliminates the need for a clean water bag. Rather than waiting for your water to filter into another bag, you simply add the inline filter to the hose of your current water bladder. Then you fill up your water bladder with dirty water, put it back in your pack, and drink from the hose as you walk. Since the filter is integrated into the hose, it filters as you drink it, so you don't have to waste time filtering the water right when you find it. The downside of the inline filter is that it slows the rate of water coming out of your tube. Some people find this frustrating, though I find that when I'm hiking I don't necessarily "chug" water. Instead, I sip at the hose in small doses, which is perfect for the flow rate. The only thing I didn't like was that I didn't have clean water at-the-ready when I wanted it. When I was taking breaks or eating lunch, I wanted a clean water bottle to chug, preferably with some flavored electrolytes in it. I carried a 3 liter Platypus water bladder tucked in the back sleeve of my pack. I drew a skull and crossbones on the bladder so I would remember that it had dirty water in it. I cut the hose on the bladder and clipped my Sawyer in-line filter into it. In this fashion I could drink dirty water directly from the bag while I was walking. As for the clean Gatorade bottle, I only ever put clean, filtered water in it. To do this, I unclipped the mouth piece from my bladder hose and strung up the bladder from a tree or trekking pole and gravity filtered the water from the bag into my bottle. It was a slow process, but I only did this during breaks or lunch so I wasn't wasting time on trail. A lot of times I put the water bladder on my head and let it filter down toward my feet. This was sometimes easier than trying to find a branch to hang it from. This method tended to get a lot of laughs from fellow hikers. Once I had a full liter, I could add drink mixes to it, and this became the water I drank when I stopped for a break. It was always wonderful chugging something with flavor after drinking straight water all day. This system worked really well for me. I know there were some people on trail who disliked the in-line filter because it kinked up on them often and they couldn't get a good flow to come out while they were walking. This happened to me a number of times, too, but I could generally get it working again without too much effort. Overall, I loved the convenience and speed of simply filtering water on the go, and I was blessed to never get a water-borne illness because of it. a) You need to wait 30 min to 4 hours to kill everything. Generally you only need 30 minutes, but even that amount of time means you have to plan your water treatments carefully and make sure you won't desperately need some before time is up. b) It's not advisable to use chemicals for more than two weeks at a time. Iodine and bleach do some seriously nasty things to your stomach. Most of the time it's too watered down to make much difference, but for those hikers who misjudged how many drops to put in their water paid the price with some stomach illnesses. I also knew a lot of hikers who got Giardia while trying to use bleach, whether from incorrect use or inconsistent use, I'm not sure. But if it were me, I wouldn't take chances. I carried Aqua Mira drops as a backup. I never wanted to be stuck in the woods with a broken filter, so drops were there for me if I needed them. It turned out that I only used them once or twice my entire trip. Usually because I filtered water from a really gross cow-trough and, though I trusted my filter, I really wanted to kill everything in there. Otherwise, I carried them for peace of mind. For hikers who want the best of both worlds - the lightness of a tarp and the comfort of a tent - a tarp tent seems like the obvious solution. Tarp Tent makes a large variety of styles, but the Contrail was the one I saw most often. It was made for one person but is roomy enough for two - it seemed to hold up beautifully in the desert, but many people discovered its downfalls in the rainier states. It had a tendency to leak, and since the mesh lining was directly connected to the rainfly (ie, single wall) it managed to get everything wet inside, too. This was the most popular choice by thru-hikers. Most opted for the one person version to save weight, but when they realized the two person version is only 7 oz more and gives you twice the space, they gave themselves a "doh!" slap on the forehead. Weighing in at 2 pounds 10 oz (with stakes and footprint) it's a comfortable way to backpack across the US. Of course, it does have its shortcomings - a tiny vestibule, small zippers that are prone to breaking, and condensation issues, but even in the wettest conditions I was usually impressed by how well it withstood the elements. For couples traveling together, the Copper Spur was an often-seen tent on trail. 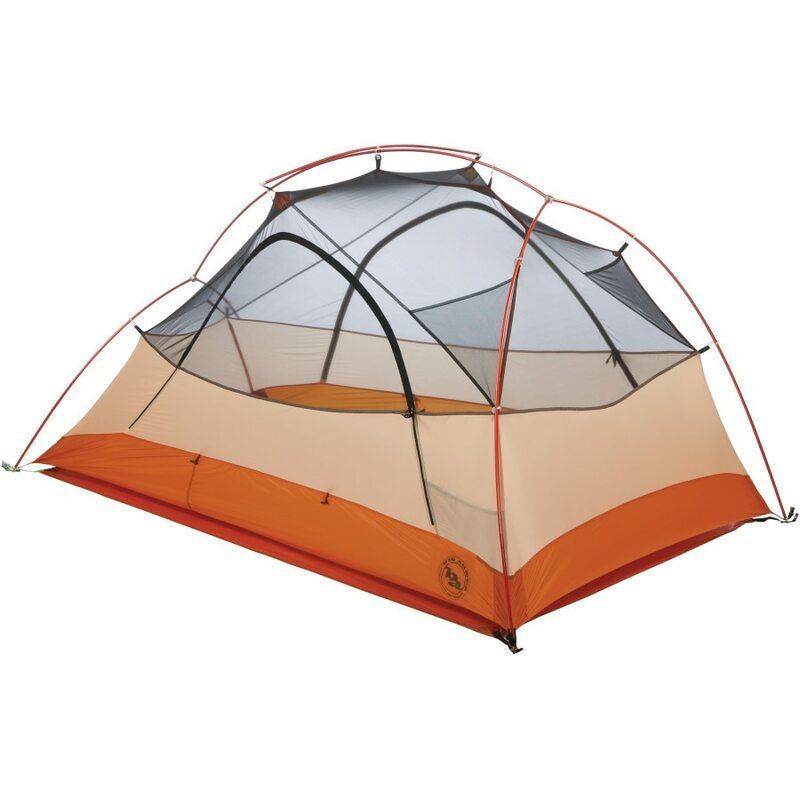 As a free standing tent, it's much roomier than the two person Fly Creek, giving each person a little more wiggle room and therefore (hopefully) keeping everyone happy. For ultralighters, hardly anything outweighs a good ol' tarp. You can rig it up in any configuration you like with some stakes and two trekking poles, and the weight you save in your pack seems to make up for the lack of comfort in less ideal conditions, right? While this seems like the way to go in more arid environments (most people slept without tents in the desert, anyway) I wouldn't be caught with a tarp anywhere north of Crater Lake. But I don't like getting drenched with rain while I sleep. Maybe that's just me. Hopefully that satisfied some gear junky cravings you've been having (admit it.) If you want to know more about what I carried on trail and how it worked for me, visit this page about my gear.